Blackbirds are a fictional creation of my own making. Due to the lack of numbers and information on Star Wars mercenary groups in Canon and in Legends. So I came up with a small independent company who’s primary M/O is airborne insertions and commando like action. what was the address? I might be able to figure something out. 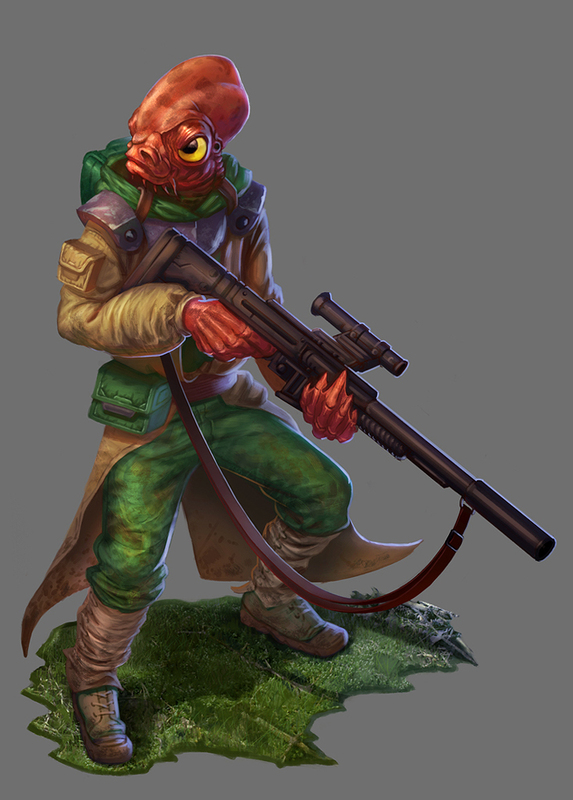 I Googled Star Wars Mon Calamari with rifles and came up with a picture that I thought was perfect. It was a drawing of a mon cal standing with a rifle, the barrel muzzle lowered down. He was not in armor, but more of a flight suit. I appreciate your efforts! Holy cow, this link went right to the picture!!!!! Well google links, don't usually work for image links. So I found the source. Damn you beat me to it. But yeah, once you the search result, you gotta right click it and hit "View Image". THAT URL is the one Ironette obtained. So the good news is that I reuploaded the image to Imgur and it'll work, the bad news is it's freaking huge. Trying to figure out how to resize in BBcode. EDIT: Ok, copy the above and paste it. That'll give you a smaller image. Since I'm apparently not competent enough to get BB code to work, I just zoomed out in browser, screenshotted the result, cropped, and resaved as a new picture. Man, that worked like a champ. Thanks to you and Ironette for all your efforts to get a pic of Rekara posted. You folks are the BEST! I aim to please, and I please where I aim. Oh god, I am the old soldier lady. Back in my day all we had to fight were droids, now it's terrorists and all kinds of garbage. It's good to be in an active game again, even with an old soldier lady. Thanks Ironette for taking on this challenge! Eh, don't thank me yet. Wait till we're six months in and I'm sending you guys on missions to blow up oilrigs. Okay, no thanks then... but I'm going to smile alot! I am happy to blow up anything and everything. I'm fine with what I assume is corporate sabotage for now. Our hotrod ship is a nice touch though, do we get to upgrade it? Mike my man, y u do this to me. What I mean by that is if. Silver posts, she'll have to wait for Mike and Fifty before posting again, that way dialogue doesn't get so jumbled. Sorry to jumble the mix... just trying to show my enthusiasm. As long as all players agree to regularly post, I'm okay with that. It is when people start to let the time between posts drag out that sims usually stall. I am confused but compliant. ...so just like my marriage I guess. Can't wait until we get to the action, this is gonna be cool.